﻿ Since Joey Jordison left Slipknot back in 2013, he’s been struggling to get back on his feet ever since. Scar The Martyr may have made a brief impact but went as soon as they came, and while Vimic remains in operation with an album supposedly due next year, there’s been so little movement from lately that it’s hardly worth getting excited about (not to mention that the band can essentially be deemed as Scar The Martyr rebranded). Where the majority of interest should be focused on is Sinsaenum, featuring members of such esteemed acts as Mayhem, Dragonforce and Dååth amongst their ranks, as well as pushing into styles of death-metal that Jordison has seldom touched before. 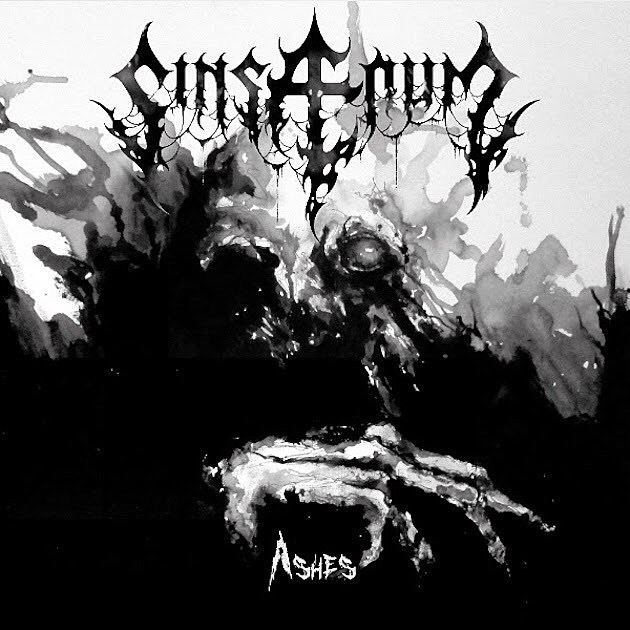 That alone makes this a far more interesting project by default, and even if Ashes does only serve as something of a taster for their sophomore full-length, Sinsaenum are already a more potent metallic force from these six tracks than Jordison has been able to forge in either Scar The Martyr or Vimic. That’s almost entirely down to the fact that this isn’t an album with any preconceived notions of crossover appeal; there’s something simultaneously deathly and elegant about the title track thanks to Sean Zartorsky and Attila Csihar’s interweaving vocals that owes a lot to frosty black-metal, and the six-plus-minute onslaught of 2099 [Heretics] is easily the most impressive display here as it moves between half-a-dozen different styles and paces. Anything that even sits adjacent to mainstream metal on this EP comes in a fragment at the absolute most, and given the overall power of it all, not to mention Jordison sounding more galavanised behind the kit than he has in a long time, that’s honestly not a bad thing. Of course it doesn’t overshadow the main catch with this EP, in that it can feel pretty inessential, especially with some contextual digging around. The first three tracks may be new, but with both Degeneration and King Of The Desperate Lands being repackaged from the Japanese release of their debut, and Dead Souls brought back from that same album with nothing but a slight remix, Ashes begins to feel like a compilation of odds-and-ends packaged together as a stopgap before a new album proper. The good thing is that this isn’t as mitigating of a factor as it could be; it doesn’t particularly impede on the impact that these tracks have, nor does it feel like a rushed job to just get something out to hit a quota. It’s even fairly admitting that, yes, this is a stopgap, and at least doesn’t try to hide its intentions like others have done in the past. If anything, Ashes might serve as something of an ideal entry point to Sinsaenum, collating what they do best into a single, manageable listen that already has plenty to get into. It mightn’t be life-changing, but for something heavier that has a decent bit to offer, you could do much worse than this. ‘Ashes’ by Sinsaenum is released on 10th November on earMUSIC.